The field of food will change radically over the next 10 –15 years. Technological advances, globalisation and individualisation are megatrends that influence all areas of our society – including what we eat. A big food trend of 2014 is the increase of diners who crave food grown in their own region, rather than delicacies trucked or flown in from far-off locales. A recently released chef survey found local sourcing figured in four of the top ten trends. The hottest trend identified: Locally sourced meats and seafood, followed closely by locally grown produce. Major restaurant chains are already featuring local sourcing in their marketing. Remember ‘Local is lekker’. To read about more food trends of 2014, Click here to read more. Each year the food industry is flooded with minor trends (food fads) that become exceedingly popular and 2014 is no different. We highlight the biggest food fad at the moment, the Cronut™. Make your own Cronut at home. Click here for the recipe. Have you ‘Liked’ us on facebook yet? If not, click here to do so. By liking our page you will be updated via your facebook home page on a daily basis of all things food related. Our facebook page is full of recipes, food articles, pictures and competitions. It’s a great way to ‘keep your finger on the pulse’, with local food information. The Cooking class programmes for June and July are up on the internet, and bookings are open. Wickedfood Cooking School, Sunninghill (in red below) runs cooking classes with a minimum of 8 participants and a maximum of 12 giving everyone hands-on experience and keeping the cooking class small enough for maximum learning. At Wickedfood Earth Country Cooking School (in green below) we run full-day Sunday cooking classes and food skills workshops, where each 3 to 6 students has their own fully-equipped cooking station. Monday 16 June at 6pm – No-Fuss entertaining (R430pp). Master your inner host/hostess and entertain your guests with a no-fuss, budget-friendly yet charming night in. Learn how to prepare a casual dinner party for six. Dishes include hummus, carrot and coriander soup, roast beef, potato gratin and chocolate mousse. Monday 23 June at 6pm – Thai master class (R430pp). Thai cuisine places emphasis on lightly prepared dishes with strong aromatic components. Thai cuisine is also known for being quite spicy as well as balancing the four fundamental taste senses in each dish or the overall meal: sour, sweet, salty, and (optional) bitter. Learn how to balance these tastes in this Thai Master cooking class. Dishes include seafood soup, Boombai pork curry, baked pineapple rice and baked mung bean cakes. Sunday 29 June at 9:30am – Sustainable living – From Earth to plate, per season. Whether you live in a flat, or sprawling mansion, you can grow your own food, and therefore become more sustainable. In this workshop we show you how to establish a vegetable garden, be it a patio or hanging garden, or something more substantial. We’ll take you on an extensive tour of the farm for an overview of what we are doing at Wickedfood Earth, and give you tips on compost making and water wise irrigation. In addition we’ll talk about seasonal crops and crop rotation. Back in the kitchen, we will cook a few of our seasonal vegetables and give you tips on how to get the most out of the seasonal bounty. Included in the price is a lunch, which we have cooked together. (R495pp. No children under 16). A big thanks to all those who supported our inaugural Pop-Up restaurant on the 31st of May. It was a huge success due to the support we got from our Wickedfood community. We are currently looking at dates for the eagerly anticipated follow up which we will be announced very soon. We recently hosted a number of corporate groups at the cooking school. We have added some photos from our classes of the last couple of weeks onto our facebook page, click here to have a look at all photos from our classes. If you are interested in our Corporate and team building classes click here for more information or you can contact Cilla on 076 236 2345. Wickedfood Earth has been recently mentioned in the news. The Times newspaper wrote an article on locally produced foods in and around the Hartbeespoort area and made mention of the work that Mike Crewe-Brown is putting in. We were also recently featured on 702’s Jenny Crwys-Williams show where local foodie Anna Trapido talked about our ‘Happy Pigs’ and the incredible taste you get from veld-raised pigs which are growth-hormone and antibiotic free. We were also mentioned as one of the stand-out stalls at the recent Cambridge Food Fair where we were selling a host of products from the farm including our increasingly famous pulled pork sandwich. The Wickedfood Earth weekly Community Country Food Market from the premises of the Wickedfood Country Cooking School is slowly gaining momentum. The Market links local producers to consumers, as well as provides a location for food lovers to get together for a quick cup of coffee, cake and chat. All food sold at this market is seasonal, locally grown and produced. All products produced on the Wickedfood Earth farm through our community upliftment training programme are available for sale at this market. Apart from products produced by our trainees, the market is also open to local farmers and artisanal producers from the Valley to sell their produce and products. Click here to see our latest newsletter, and Click here for our Cooking School photo gallery. 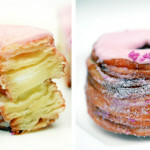 The Cronut™ (Croissant-Doughnut) pastry which is really just a deep-fried ring of croissant dough, was created by Parisian-born baker Dominique Ansel at his eponymous bakery in New York in May 2013. On any given morning, queues stretch around the block in Spring Street, NY to get their hands on a famous Cronut™. Doughssants, zonuts and croissnuts in every flavour are starting to find their way into local bakeries around the world. They have the shape and flavour of a doughnut, yet feature the crispy, flaky texture of a buttery croissant. Learn how to make this delicious mash-up food trend of 2014 at home. Click here.